Dr. Andrew Bostom, a medical doctor and expert on radical Islam, is worried that Sharia – extremist Islamic law – could make its way into the U.S. Muslim community. “My concern is to look at institutional Islam: we see the example of the Middle East, where clearly Sharia is being sanctioned by the major religious teaching institutions,” he tells Newsmax TV’s John Bachman. The Assembly of Muslim Jurists of America is a mainstream group that provides training to imams in the U.S. and Canada. It provides online opinions — fatwas — on all kinds of religious and political issues for Muslims. It’s not just about “piety of practice but also issues like what do you do with a blasphemer, someone who criticizes the religion or criticizes Mohammed?” says Bostom. The answers provided for North American Muslims are the same as would be offered by imams in Saudi Arabia or Iran might answer them for North American Muslims, says Bostom, author of the new book “Sharia Versus Freedom: The Legacy of Islamist Totalitarianism.”. So how can we stop the infiltration of Sharia? “It’s just affirming our own principles,” he says. A recent survey of 600 high-achieving Muslim Americans showed that 60 percent favor the use of blasphemy law, Bostom says. That would mean people who criticize Islam or Mohammed would be punished. Boko Haram’s deadly insurgency is fuelled by their desire to see stricter Islamic law, or Sharia, in northern Nigeria. Civil rights activists have voiced their concerns that poor people would bear the brunt of a more severe form of Sharia. Sharia has been practised to varying degrees for as long as Islam has been in Nigeria. But in 1999, the then-governor of Zamfara State, Ahmed Sani, called for criminal cases to be tried in Sharia courts. Civil rights activists in Nigeria complain that Sharia hands down harsh sentences to poor Muslims, while the rich use it to their advantage. Ahmed Sani, the architect of Sharia in modern Nigeria, is a case in point. He married a child bride from Egypt last year and condoned his actions citing Sharia, which permits men to marry wives as young as 13. Several Sharia cases have brought condemnation from the international community. Most of them have involved poor women accused of adultery who face being stoned to death. But some argue that it is Nigerian legal system that is at fault. Nigeria’s 70 million Muslims already have the choice of having civil cases heard in a Sharia law court. Twelve northern states also allow the resort to Sharia in criminal cases. What Boko Haram is demanding is for Sharia to replace common and customary law in the 19 states that make up northern Nigeria. The group also wants to see a stricter form of Sharia implemented, as in Saudi Arabia or Iran where stoning and amputations are not uncommon. The problem is that there are several million non-Muslims living in these states. And that wealthy Nigerians tend to be able to escape justice more than the rest of the population. A Christian girl accused of blasphemy over the burning of the Koran has been acquitted by a Pakistani court, her lawyer said. Rimsha Masih, 11, faced the death penalty after being arrested in Islamabad in August when her neighbour Mohammed Khalid Chishti, a Muslim cleric, accused her of desecrating the holy book. The cleric was later accused of ‘framing’ Masih by fabricating evidence in a case that went to the highest levels of the Pakistani government and sparked international outrage at the country’s strict blasphemy laws. Attorney Abdul Hameed said a court in Islamabad dismissed all the charges against Masih on Tuesday, concluding they were based on heresy and incriminated material that was planted in the girl’s possession. ‘I am happy that the poor girl’s ordeal is now over,’ Hameed said. 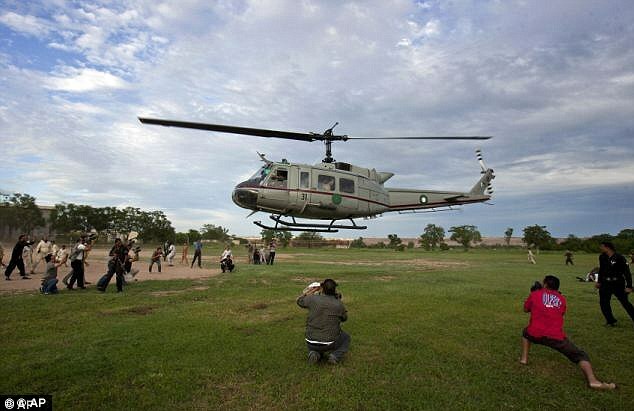 Masih was released on bail in September but was flown by helicopter to an unknown location. There were fears Masih and other Christians in her neighbourhood could be in danger if she remained there. In Pakistan, the mere allegation of causing offence to Islam can mean death, with some killed even if they are found innocent by the courts. However, this was a rare occasion when senior Islamic clerics intervened to oppose the charges levelled at her. Sympathy for the girl has been heightened by unsubstantiated claims that she is mentally impaired and has Down’s Syndrome. She was accused of carrying charred pages from the Koran near her house in a poor neighbourhood on the outskirts of Islamabad. In an extraordinary development, however, three officers from the local mosque accused Chishti of planting the pages among the charred refuse Masih had been carrying to strengthen the case against her. Tahir Naveed Chaudhry, another of the girl’s lawyers, said the testimony of a local police officer, who told a court there was no evidence against her, had proved crucial in securing her acquittal. The officer had appeared to ‘arrest’ Masih in mid-August to protect her from protests by the majority Muslim community in the Mehrabad district. Chaudhry went on to demand changes to Pakistan’s religious laws, which were strengthened during the hardline conservative rule of Muhammad Zia-ul-Haq in the 1980s. Concerns remains over the safety of Masih, who is unlikely to return to Mehrabad because of continuing support among many for Chishti. ‘While I’m thrilled to hear the charges have been quashed, my foremost concern at the moment is her safety,’ said Tahira Abdullah, a rights activist in Islamabad. Many Christians moved out of the area during protests in the weeks after her arrest. Jordan’s anti-government riots aimed ultimately at removing King Abdullah from power are so severe that the government has turned 10,000 of its soldiers into riot police. Religious Freedom Coalition President and Founder William Murray said the ruthlessness of the rioting prompted the move. “The king has given police uniforms to 10,000 soldiers to try to maintain order,” he said. Those soldiers-turned-police are not the only ones guarding the king. Terrorism analyst and Act for America President Brigitte Gabriel said there are U.S. troops on the ground in Jordan. Murray reported that aid workers with his organization in Jordan have come astonishingly close to the action. She warned that the king’s position is in danger. However, the king’s decline in approval is a recent development. As WND reported, as recently as October, the king remained popular. International Christian Concern Middle East analyst Aidan Clay said most Jordanians support the king. “The king remains fairly popular and the king is still a seasoned politician who may be able to offer concessions that the Muslim Brotherhood accepts,” he said. “However, it is also true that every Jordanian is fed up with the widespread corruption within the government. “Of most concern is that the MB is among the primary groups calling for political reform,” he explained. “If that continues to be the case, then many Jordanians may decide to back the MB, whether or not they agree with the Muslim Brotherhood’s religious ideology. Free elections, ending corruption, higher wages, and other claims all sound great, no matter who’s leading the campaign – whether it’s the MB or liberals. Gabriel said the uprising in Jordan is the product of America’s previous actions in Egypt and Libya. “We are seeing a reawakening of radical Islam all over the Middle East empowered by the weakening American perception throughout the Muslim world,” she explained, adding that another factor intensifying the protests is the perception that King Abdullah is a Western pawn. She added that the rebels are learning from recent radical movements. “They are learning that what produces results are powerful organizations like Hamas dedicated to jihad and bringing pride and strength back to the Palestinians through Islamic warfare instead of a mamby-pamby let’s sit together and have coffee while we talk about the problem in Abbas and King Abdullah style,” Gabriel said. 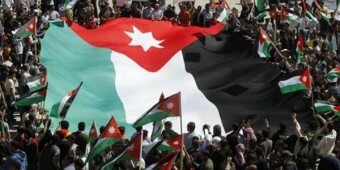 WND also reported that the momentum from the Arab Spring has prompted the radicals to shift their attention to Jordan. Jordan is the latest target in the gun sights of the Muslim Brotherhood and other radical jihadist elements. WND reported in December that the Arab Spring was a front for the expansion of jihadist regimes. Lopez referred to a document introduced as evidence in the 2008 Holy Land Foundation terror funding trial. Israeli soldiers near the border with Gaza on Friday. JERUSALEM — Emboldened by displays of Egyptian solidarity and undeterred by Israel’s advanced aerial firepower, Palestinian militants under siege in Gaza broadened their rocket targets on Friday, aiming at the holy city of Jerusalem for the first time, sending a second volley screeching toward Tel Aviv and pushing the Israelis closer to a ground invasion. 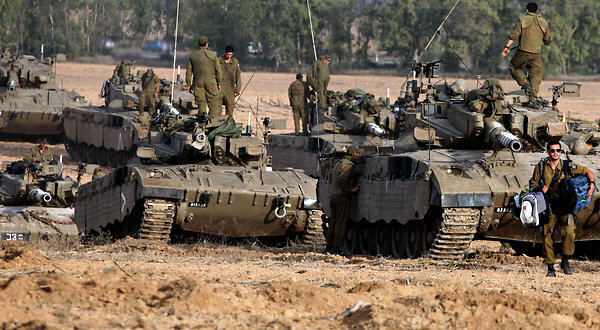 Israel’s government more than doubled the number of army reservists it could call to combat if needed in the increasingly lethal showdown with Gaza’s Hamas fighters and their affiliates, after they fired more than 700 rockets into southern Israel over the last year. The escalation has raised fears of a new chapter of war in the intractable Arab-Israeli conflict. The Israeli military closed some roads adjacent to Gaza in anticipation of a possible infantry move into the territory, which would be the first Israeli military presence on the ground in Gaza since the three-week invasion of 2008-9. The Israeli military chief of staff, Lt. Gen. Benny Gantz, went south to brief regular forces and reservists. “We are here tonight on the eve of a possible ground operation,” he said. Many residents of Jerusalem, which Israel claims as its capital despite objections from the city’s large Palestinian population and others throughout the Middle East, were startled when wartime sirens warning of impending danger wailed at dusk, followed by at least two dull thuds. Hamas’s military wing claimed in a statement that they were rockets fired from Gaza, 48 miles away, and had been meant to hit the Israeli Parliament. The police said one of the rockets crashed harmlessly in open space near an Israeli settlement south of Jerusalem. It was unclear where the others landed, but no damage or injuries were reported. Earlier in Tel Aviv, 40 miles from the Gaza border, air-raid sirens wailed for a second day as a rocket fired from the territory approached. A police spokesman, Micky Rosenfeld, said it apparently fell into the Mediterranean. Although the rockets missed their intended targets, the launchings aimed at Jerusalem and Tel Aviv, the two biggest population centers, underscored the ability and willingness of Hamas rocket teams to target Israeli or Israeli-occupied areas that up until the past few days had been thought relatively immune. “We are sending a short and simple message: There is no security for any Zionist or any single inch of Palestine and we plan more surprises,” Abu Obeida, a spokesman for the military wing of Hamas, said in a message reported by news agencies. Even Saddam Hussein, when he led Iraq, avoided targeting Jerusalem when he aimed Scud missiles at Israel during the Persian Gulf war in 1991, not wishing to inadvertently destroy Muslim shrines or hit Arab neighborhoods. Despite three days of repeated Israeli aerial assaults on suspected stockpiles of rockets in Gaza, the Israel Defense Forces said more than 100 were fired into Israel on Friday, apparently including Iranian-made Fajr-5 projectiles that Israeli officials say are the only ones in the Hamas arsenal with a range that can reach Tel Aviv or Jerusalem. Hamas contended it had produced those rockets, which the group called M75s, referring to a range of 75 kilometers or roughly 47 miles. Israeli munitions experts said they had never heard of that weapon. Regardless, the rocket barrage caused widespread panic and damage. It also shattered plans for a temporary cease-fire during an unprecedented trip to Gaza by the Egyptian prime minister, Hesham Qandil, a visit that illustrated the shifting dynamics of Middle East politics since the turmoil of the Arab Spring uprisings began nearly two years ago. Under the last president, Hosni Mubarak, regarded by Israel as an important strategic ally, any relationship with Hamas would have been unthinkable. “The time in which the Israeli occupation does whatever it wants in Gaza is gone,” Ismail Haniya, the Hamas prime minister, said in a meeting with his Egyptian counterpart. The persistent ability of Hamas to keep firing missiles at Israel on Friday appeared to weigh heavily in the Israeli military’s calculations about a ground invasion. Prime Minister Benjamin Netanyahu said the Israeli Army was “continuing to hit Hamas hard and is ready to expand the operation into Gaza.” Israeli television later reported that Defense Minister Ehud Barak had authorized the military to call up 75,000 reservists if necessary — more than double the 30,000 authorized Thursday. No Israelis were reported killed in the rocket attacks on Friday, leaving the reported death toll on Israel’s side at three civilians. The number of Palestinians killed so far in the three days rose to at least 30, Gaza health officials said, underscoring what critics of Israeli policy called Israel’s disproportionate use of military force. Israeli leaders have said they are selectively targeting militants in the Gaza attacks, and they blame Hamas for installing rocket batteries in civilian areas. The Israeli military said Friday night that it had killed Muhammad Abu Jalal, a Hamas company commander in Gaza, and Khaled Shaer, who was involved in rocket development. A military spokesman said that earlier in the day, the Israel Defense Forces had sent text messages to about 12,000 Gaza residents warning them to stay away from Hamas operatives. In addition, the military said it had crippled Hamas’ burgeoning drone capabilities after striking a number of sites. Hamas, it said, had been developing unmanned aerial vehicles for use as another means of striking Israel. The Egyptian prime minister’s three-hour visit to Gaza early in the day produced dramatic imagery to underpin his government’s support for Hamas, which Israel, the United States and much of the West consider to be a terrorist organization. It does not recognize Israel’s right to exist. He said a cease-fire between Hamas and Israel was “the only way to achieve stability in the region” and called on the Palestinians to repair the rift between Hamas in Gaza and Fatah, which dominates the Palestinian Authority in the West Bank. Isabel Kershner reported from Jerusalem, and Rick Gladstone from New York. Reporting was contributed by Jodi Rudoren and Fares Akram from Gaza City, Alan Cowell from Paris, Rina Castelnuovo from the Gaza-Israel border, and Mayy El Sheikh and David D. Kirkpatrick from Cairo. A version of this article appeared in print on November 17, 2012, on page A13 of the New York edition with the headline: Gaza Militants Target Jerusalem With Rockets for First Time in Conflict. In an ominous sign that the violence in Gaza may continue to escalate, a key member of the Israeli Knesset tells Newsmax that the Jewish state is prepared to launch a ground invasion of Hamas-held Gaza in the next 24 to 48 hours, if Palestinian terrorists continue to launch rocket barrages at Israeli cities. On Thursday, the Israeli cabinet decided to call up 30,000 reservists. This came on the same day that the Tel Aviv area came under rocket fire. It marked the first time Tel Aviv came under attack since the 1991 Gulf War. Knesset member Tzipi Hotovely, who often is described as the “intellectual voice” of Prime Minister Benjamin Netanyahu’s Likud Party, tells Newsmax: “I must say, for many Israelis this is a big issue. Shooting into the most important city is like shooting rockets into New York. Hotovely spoke to Newsmax just before midnight in Israel, while driving to the southern area where three Israelis were killed in a rocket attack earlier Thursday. She emphasized that Israel wants peace with its neighbors, but will act to defend its citizens from deadly missile barrages. Some analysts suspect an additional motive for the attacks: The need to weaken Hamas and impair its ability to attack Israel, if an attack must be launched this spring to destroy Iran’s nuclear facilities. In the past week, Hamas has fired over 220 rockets into Israel. Approximately 80 of the rockets have been intercepted by Israel’s Iron Dome missile defense system. Hotovely tells Newsmax that Israel is prepared to launch a ground attack in Gaza in order to further decimate Hamas and its weapons caches, if an assault proves necessary in order to halt hostilities. Israeli F15s have been relentlessly pounding targets in Gaza in response to the rocket salvos that have forced over a million Israeli citizens to hunker down in bomb shelters and safe rooms throughout the region. Hotovely says Israel’s leaders are waiting only to see if Hamas, which denies Israel’s right to exist, will cease its attacks. Internationally, concern is spreading that the strong Israeli response to the escalating rocket attacks from Gaza could trigger unintended consequences throughout the volatile region. Egyptian President Mohamed Morsi, a member of the Muslim Brotherhood, has recalled Egypt’s diplomatic representative from Israel in protest of the Israeli assault. On Wednesday, a precisely targeted attack killed top Hamas military chief Ahmed al-Jabari, who Israelis say is the mastermind behind a number of attacks on the Jewish state. Morsi finds himself squeezed between Egypt’s treaty obligations under the Camp David accords on the one hand, and a growing animus in Egypt to take action to defend Gaza’s Palestinians. “Israelis must recognize that we do not accept this aggression,” Morsi told Egyptians Wednesday in a televised address. As a sign of his nation’s support for Palestinians, Morsi ordered his prime minister and Egyptian diplomats to travel to Gaza on Friday. But Hotovely tells Newsmax that time is running out for the Islamists in Gaza to cease hostilities. Asked if she expects ground troops to push into Gaza in the next 48 hours if the rocket attacks continue, she replied: “Yes, I think that we’re not afraid of doing that. She added, “The IDF has many and various ways to show its power, and to use the information we have about the leaders of Hamas. Most terrorists at the moment are busy hiding from the IDF forces and the Israeli air force. The last time Israel launched a ground assault in Gaza was in January 2009. Over 1,000 Palestinians and 13 Israelis died in that conflict. President Barack Obama has been in touch with Morsi and the Netanyahu government. The administration has issued a statement supporting Israel’s right to defend itself from rocket attacks, while urging an immediate end to the hostilities. Commented Hotovely: “At the moment, it appears that as much as the American president would like to keep things silent in the Middle East and not be under war. Unfortunately, it doesn’t go this way. Hamas is an offshoot of the Muslim Brotherhood which now controls Egypt, Israel’s most powerful Arab neighbor and a crucial partner in the 1979 peace treaty that stands between fragile stability and regional chaos. Cairo condemned the offensive and recalled its ambassador to Israel. Israel’s ambassador left Cairo on what was called a routine home visit and Israel said its embassy would stay open. Israel’s Iron Dome interceptor system shot down dozens of some 130 rockets fired from Gaza in the first few hours of daylight on day two of Operation Pillars of Defense, the army said. Israel on Wednesday assassinated Hamas’s military mastermind Ahmed Al-Jaabari and shelled the enclave from the land, sea and air, killing 13 people, including five militants, three children, and a pregnant woman. More than 100 were wounded. “The leaflets stress that Hamas is dragging the region toward violence, and that the IDF is prepared to defend the residents of the State of Israel until quiet is restored to the region,” the military said in a statement. “There is no justification for the violence that Hamas and other terrorist organisations are employing against the people of Israel,” said Mark Toner, deputy State Department spokesman. Hamas has said the killing of its top commander would “open the gates of hell” for Israel. It also appealed to neighbouring Egypt to halt the “barbaric” assault. His Cabinet has granted authorisation for the mobilization of military reserves if required to press the offensive, dubbed “Pillar of Defense” in English and “Pillar of Cloud” in Hebrew after the Israelites’ divine sign of deliverance in Exodus. Israel says it has already destroyed much of Gaza’s longer-range rocket stockpiles, an assertion seemingly confirmed when Hamas claims of hits on ambitious targets such as Tel Aviv, Ashdod, and Israeli naval craft proved unfounded. The flare-up on Israel’s southern front came in a week when, up north, it fired at Syrian artillery positions it said had shot into the Israeli-annexed Golan Heights amid a civil war in Syria that has brought renewed instability to Lebanon next door. Israel’s Operation Cast Lead in 2008-2009 began with a week of air attacks and shelling, followed by a land invasion of the blockaded coastal strip, sealed off at sea by the Israeli navy. Some 1,400 Palestinians were killed and 13 Israelis died. Hamas has been emboldened by the Islamist rise to power in Egypt, viewing President Mohammed Morsi as a “safety net” who will not permit a second Israeli thrashing of Gaza, home to 1.7 million Palestinians. Gaza has an estimated 35,000 Palestinian fighters, no match for Israel’s F-16 fighter-bombers, Apache helicopter gunships, Merkava tanks and other modern weapons systems in the hands of a conscript force of 175,000, with 450,000 in reserve. Why can’t Islam apologize? Shouldn’t tolerance be a two-way street? Shouldn’t tolerance be a two-way street? At a certain level, this seems fair enough, even though the person responsible for the video was not under Morsi’s legal jurisdiction –to allow or not to allow. Regardless, one should not go about insulting other people’s religion. If I were a Muslim, I would be offended, though I might not have taken the bait on such a trivial incitement (in the sense that this was some guy in his garage studio, not a government or a religious body speaking). The Obama administration did everything it could to condemn this film. On the other hand, shouldn’t this be a two-way street? If President Morsi demands that no one in the West insult Islam, how about saying something regarding the frequent insults to Judaism and Christianity in the Middle East? Why, for instance, didn’t he denounce the burning of the Bible in front of the US Embassy last month? As outrageous as these examples are, they are not at all exceptional. By going to the website of the Middle East Media Research Institute, anyone can peruse the almost daily splenetic vituperations against Jews and Christians that appear in the Muslim media. OK, then, let’s address the asymmetry between Muslim outrage at perceived insults to Islam, and the seeming Muslim indifference to insults to Judaism or other non-Islamic religions. Is this a matter of hypocrisy, or something else? In other words, mainstream Sunni Islam does not regard reason as a legitimate basis upon which to discern morality or to choose religion. Mohammed al-Ghazali (1058-1111 AD), considered by many Muslims to be next only to Mohammed in importance, said that reason can only know self-interest. He also advised that “the mind, which, once it testifies to the truthfulness of the prophet, must cease to act.” If reason cannot independently know right from wrong, how could it be trusted to know true religion from false? Integrity of reason is essential to freedom of conscience. Without it, conscience means nothing – which is why so many Muslims view conversion from Islam as, necessarily, an act of perversion which should be punished. The inviolability of conscience has as its ultimate source the idea of man as created in the image and likeness of God. That image includes reason’s ability to come to know the truth and of the will’s capacity to choose it freely. In Islam, it is blasphemous to say that man is made in the image and likeness of God. Therefore, the notion of inalienable rights is alien to it. Ultimately, respect for other religions is not based on the content of those religions, as those who hold one religion must of necessity consider the others false or wanting in some way. It is based upon respect for human beings in so far as they possess inalienable rights, especially freedom of conscience. This understanding helps us to appreciate why, within Islam, the denigration of other religions is standard fare, and why it would not naturally occur to many Muslims that this would be a problem. And that, in itself, is a problem with which we must come to grips by something other than our own apologies. Robert R. Reilly is a member of the board of the Middle East Media Research Institute and the author of The Closing of the Muslim Mind. Islamist rebels are invading Christian communities in Syria – fighting to capture Aleppo’s mostly Christian neighborhoods of al-Syriaan al-Jaddie and al-Syriaan al-Qadime. Reports from Middle East analysts say the battle for the Christian neighborhoods started last week. Religious Freedom Coalition President William Murray said there’s a reason the Free Syrian Army chose to fight over the Christian neighborhoods. Murray said this is a familiar tactic. Although International Christian Concern Middle East analyst Aidan Clay said accurate information on Syria is limited, he’s confirmed the fighting in several Aleppo enclaves. “Reports indicate that rebels have advanced into several central neighborhoods, including Christian areas, of Aleppo in recent weeks,” Clay said. He said Aleppo is rapidly becoming a hub for rebel forces. Clay added that the opposition forces are comprised of more than ethnic Arabs. “The FSA, which now controls most of Aleppo, is very diverse,” he explained. “Among rebel fighters and their supporters are many Syrians who truly desire free elections and other reforms that come with democracy. The schism Clay talked about is already happening. Analysts report that a rift has developed between ethnic Kurds and the ethnic Arabs in the coalition to topple Bashir Assad’s government. Clay added that there are also competing agendas among the various rebel factions. He said the various groups are speculating on how much freedom they will actually gain by overthrowing Assad. Clay also said Christians are experiencing the most hardship because they have the most to lose if Assad is overthrown. “While many Christians have publicly denounced the brutality of President Assad and by no means support the regime, many Christians still desire greater freedoms and political reform to be enacted by the current government,” Clay said. However, Christians’ hopes for reform are growing dim. “That, of course, will never happen as Assad has chosen time and again to use brutal force in response to peaceful protests, killing thousands of civilians,” Clay said. “At the same time, however, most Christians see little hope in an alternative government which, they fear, will be led by Islamists who will hinder or outright abolish the religious freedoms long experienced by Christians in Syria. “Due to ongoing violence and fears of radical Islamic factions, church leaders in Aleppo have reported that many Christians have already fled the city. 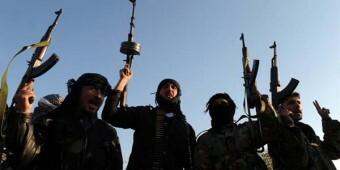 According to Agence France-Presse, Syrian rebels have openly stated their goal of transforming Syria into an Islamic state while proclaiming that Christians have no connection to the country. Clay added that many Christians fear Aleppo will become like the already looted city of Homs. “They vividly remember what happened in Homs earlier this year when most of the Christian community fled the city, often by force,” he said. “A similar story is beginning to unfold in Aleppo where there have been several bombings in Christian-majority neighborhoods, a few Christian kidnappings and an Armenian church that was reportedly set on fire by rebels on Monday. Egypt’s Christian community has also experienced an increase in persecution. Clay cited the persecution numbers since the ouster of former President Hosni Mubarak. Murray said rebels are already targeting Christian clergyman, and he cited the recent capture and murder of an Orthodox priest. “The attacks on Aleppo are on the heels of the kidnapping and torture death of an Orthodox priest by the Islamist rebels just a few days ago,” Murray said.